It wasn’t long after setting foot in Spain for the first time in January 2017 to do my third semester in Valencia that I realized that this is the place where I belong. Being a film scoring major and being a Los Angeles native, one would think that L.A. is where I’m meant to be. The career opportunities, the ability to put my education to work in a city with an abundance of creative professionals makes it almost too obvious that I should be there. Not to mention that my family is there, and I spent eighteen years living there. But my heart is in Spain. I’ve realized that in order to find success in life one needs to first feel happy, motivated, and comfortable with their circumstances so that they have the mental, emotional, and physical capacity to attain career success. I have found this in Spain. 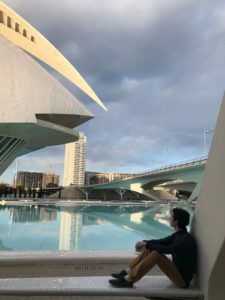 Learn more about studying abroad in Valencia, Spain. One of the most important lessons I learned in Spain in spring 2017 is that we should try to live to work rather than work to live. The Spanish lifestyle as I’ve come to know it places its value more in spending time with loved ones, taking time at meals to really enjoy the food while talking with those around you, and above all, giving ourselves a chance to rest. We can’t work 16 hours a day or more, 7 days a week, and expect to be healthy, creative, and productive artists—I’ve done it before, and it’s not sustainable. We need balance. Though I can acknowledge the value of living in a city like L.A. with plenty of opportunity and can recognize the appeal of living in a city for that reason, I cannot accept that future for myself right now. I believe that when you lead a balanced life, you can create opportunity. Since being back in Valencia, I have been networking in the community to turn my project of making a documentary series about culture that I can score into a reality. 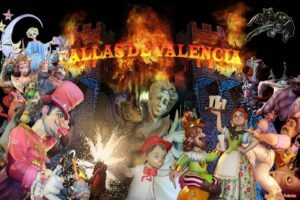 I have been gathering a team of filmmakers from Berklee, Emerson, and the Universitat Politècnica de València to make a documentary about the yearly Valencian festival, Las Fallas. With the help of a diversity grant from Berklee Valencia, I can do a project which is meaningful to me and can open the door to my being able to stay in Spain after graduating with a great film to add to my resume. Meanwhile, I am also taking the opportunity to travel as much as I can. 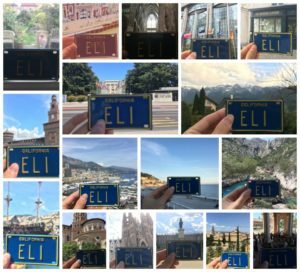 During spring 2017 and the summer after, I went to 27 cities in 11 countries (travel in Europe is cheap!). I fell in love with traveling, especially alone, and gained a wealth of experiences and friendships that taught me and inspired me as both a person and as a composer. This semester, I will be traveling to Granada, Madrid, Vienna, Tangier, Chefchaouen, and Maastricht to continue having these experiences and developing myself as a person and musician. The fact that these cities with such rich histories are just cheap trains / flights away are among countless reasons why I think Spain is my place to be. Eli Slavkin is an L.A.-bred, Spain-based film composer and documentarian with a deep love of music and cultures from around the world. 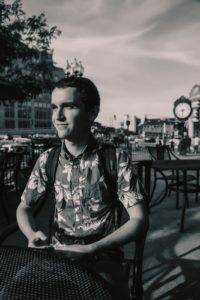 He has scored projects from USC, New York Film Academy (NYFA), and Berklee, where he graduates in May 2019. His core mission as a global-minded composer is to celebrate and share diverse cultures by producing and scoring a series of documentaries which take cultures unfamiliar to most people and bring them to light.